So sang a soaring chorus of voices—young and old—inside Hyde Park Union Church on Nov. 6. The songs were interrupted by a somber litany of names: Chicago youth killed since the school year started in 2008. The event was called “Urban Dolorosa,” a commemoration held at five different churches around Chicago in November casting the Biblical mourning of Mary for her son in the context of contemporary youth violence. The scene is a painful and all-too-familiar reminder of the youth violence epidemic that has gripped Chicago, the home of more youth homicides than any other American city. Chicago has a homicide rate more than double those of New York City and Los Angeles. In Chicago, more than 530 people under the age of 21 have been killed since 2008 and many more have been shot or have otherwise suffered violence—often at the hands of their peers and particularly in the city’s African-American and Latino communities. Nearly 80 percent of youth homicides occurred in 22 black or Latino communities on the city’s South, Southwest and West sides—even though just one-third of the city’s population resided in those communities. The rate of youth homicide in West Englewood on the city’s South Side, for instance, was nearly five times higher than the citywide mark. In contrast, there have been 22 other Chicago communities with no more than 1 youth killing since 2008. Many were located on the city’s North Side, but others like Beverly, Garfield Ridge, Hyde Park and Mount Greenwood did not lose any youth to violence but are next to or just a few minutes drive from others with some of the highest youth homicide rates in the city like Woodlawn, Roseland and Morgan Park. Much attention has been paid to the crisis. Community groups have held countless marches, candlelight vigils and events featuring empty desks signifying slain students. After Christian Fenger Academy High School student Derrion Albert was beaten to death in September 2009, U.S. Attorney General Eric Holder and U.S. Education Secretary Arne Duncan visited Chicago and pledged to address youth violence, with Duncan calling Albert’s death “a line in the sand.” They announced a $500,000 grant to restore a peaceful environment at Fenger. Yet the drumbeat of violence continued, with 218 student shootings and 27 student deaths reported during the ensuing school year, according to media reports quoting then-CPS CEO Ron Huberman. And while the framing of violence suffered by Chicago public school students has focused much of the attention—and resources—on that population. The most dangerous time for young people in Chicago may be the first few years after high school. Since 2008, a total of 247 young people between the ages of 18 and 20 have been murdered in Chicago, nearly as many as the 286 under the age of 18 who’ve been killed during that span. Each death or serious injury also causes wide-ranging ripple effects on friends and family members who are left with the psychological burden of witnessing violence. Studies strongly suggest that when young people live in neighborhoods plagued by violence, even when they don’t directly suffer violence, they are considerably more likely to suffer from post‐traumatic stress, depression and anxiety, and are more prone to behavioral problems and academic underachievement. 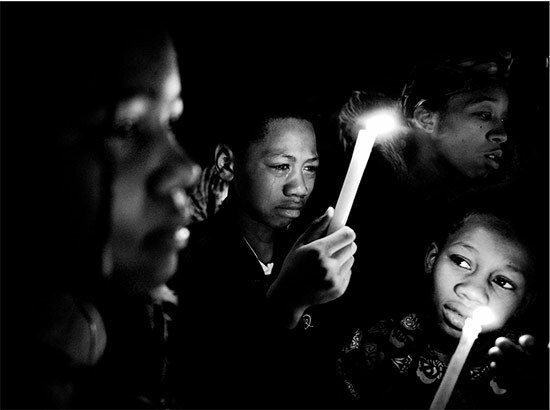 The numbers of youth deaths and shootings have not been significantly reduced despite efforts by Chicago politicians and police, including the Community Alternative Policing Strategy (CAPS), the concentration of officers in neighborhoods with high gang activity, the “Culture of Calm” program instituted in “high-risk” public schools, and the efforts of well-known non-profit organizations like the peer intervention group CeaseFire. Community members, youth advocates and youth themselves consistently say that it is nearly impossible to curb youth violence without addressing the underlying social conditions: extreme racial and economic segregation, a lack of job opportunities, limited access to higher education, violence-plagued and under-funded public schools, broken families and a general feeling of hopelessness and marginalization among many Chicago residents. Despite the daunting nature of the problem, many Chicagoans are fighting in their own personal ways against the epidemic of violence and despair. Here we profile several groups and individuals whose efforts are not reflected in crime statistics or economic indicators, but who nevertheless have an undeniable impact on their communities. The nascent group Spitfire uses music to offer a positive but unvarnished outlet for young rappers coming from neighborhoods where violence “is always easy to find, and if you don’t pay attention it will find you,” in the words of 22-year-old Bronzeville resident Eric Brown aka musician Young DBoy Low. Simply telling stories—set to beats—of real life in the ‘hood and the struggle to remain humane and sane in the face of violence is itself an act of resistance and revival in the eyes of Spitfire founder Henry Mann and the young artists who have signed on with the group. The sister grassroots activist organizations Southside Together Organizing for Power (STOP) and Fearless Leading by Youth (FLY) use direct action to address the social and economic inequities that underlie youth violence. They fight for the rights to decent housing and health care, among other things, demanding a trauma center for the South Side and opposing the planned closing of public mental health clinics in poor neighborhoods. 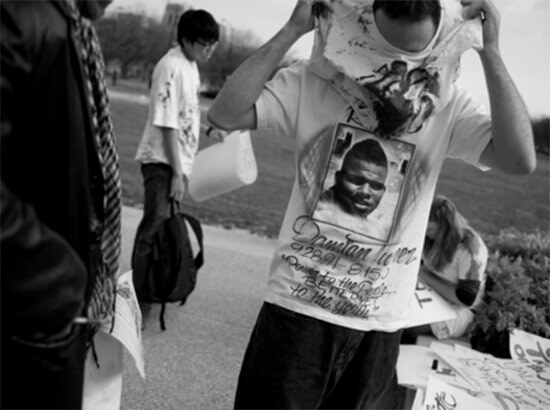 The groups were born around housing issues in the Woodlawn and Englewood neighborhoods, and accelerated with the death of Damian Turner, an 18-year-old founding member who was shot just blocks from the University of Chicago Medical Center and died after being transported downtown to Northwestern Memorial Hospital. Seventeen-year-old Ondelee Perteet never intended his life to be defined by violence; as a young teen he avoided gangs and guns. 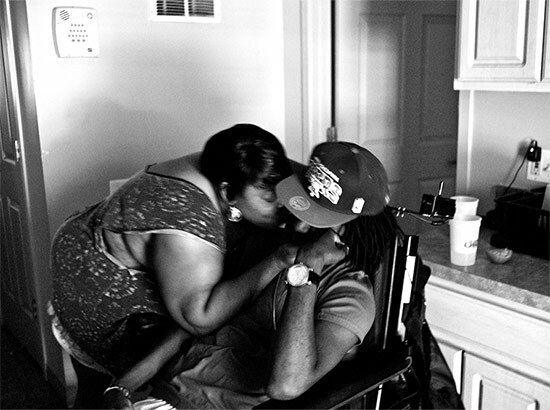 But that all changed in 2009 when he was shot in the chin at a party and paralyzed from the neck down. Since then he and his mother have lived a brave, stark personal struggle to survive and succeed despite the tragedy—simultaneously becoming a symbol of hope and a living testament to the horror of gun violence. When asked what could be done to reduce the carnage, these community members echo academic and law-enforcement experts in saying there are no easy answers. One thing they stress is that people must not give up: society must not give up on the youth in these neighborhoods and, even more importantly, the youth must not give up on themselves. This is the first in a series on youth violence. Funding for this project was provided by The Chicago Community Trust via the Community Media Workshop, the Richard H. Driehaus Foundation, and the Mansfield Institute for Social Justice and Transformation.